The Bilt-Rite Orthopedic Slanted Seat Cushion is great for use in the car, at a sporting event, or just about anywhere else. The angle of the cushion helps you to achieve a more natural and comfortable posture when sitting. 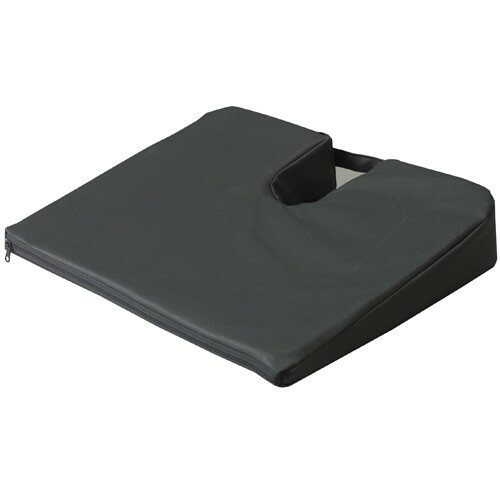 With the use of this cushion you can relieve lower back pain. Due to the cutout at the back of the cushion it is also great for people who experience tailbone pain. When using the cushion correctly the Coccyx area should be over the cutout, which relieves pressure on the tailbone. The cushion has a convenient washable vinyl cover. The cushion itself is contructed of a tough and resilient polyfoam which gives you the support you need, even when sitting for long periods of time.